Nothing screams Scandinavian more than a burly blonde man maiming an opponent with a rather large axe. 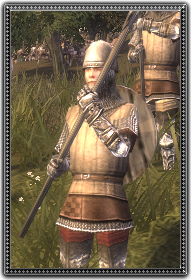 Being as the axe is a favoured weapon of all Norsemen, it comes as no surprise to find these northern mercenaries armed with two-handed "Danish" Axes. Girded in heavy armour, Norse Axemen can absorb much punishment, before they dish out threefold.